Everyday people can post photos of how they decorate for the season. Some info may have been lost in translation, but I believe the idea was to showcase how Ikea plays a part in your Holiday decor. These are some of my favorites...and now I think I am heading to my closest Ikea to see what I can find to make my home look this fabulous! 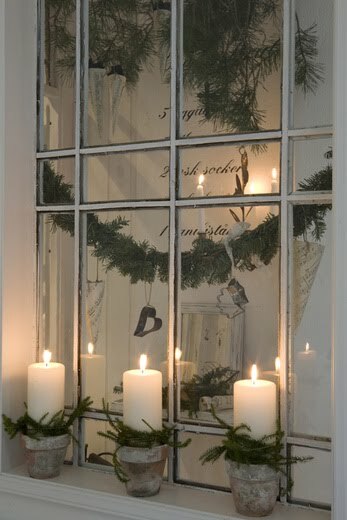 I am soooo making a mirror like this for my hallway. Love it. The simplistic beauty of this table is incredible. I love everything about it. And where do I begin this this room?? I am in love with the wood walls and painted floors! 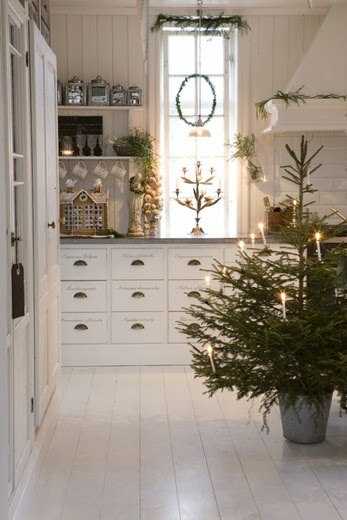 And that cabinet...oh I want it sooo bad....I see another addition to the "honey-do" list once my desk is finished. The hubby just may have to make one for me! It looks just like the one Holly painted...if only Canada wasn't across some silly border. I would have bought it and hauled it home as soon as I saw it. I still go on her website to stare at it now and then. Yes, Holly. That is me stalking you with 1000 hits a day on your site. I am coveting the dresser. Don't tell me who bought it. I may start stalking them, too! So simple and beautiful. Again with those walls...I am crazy in love with them! I am so glad my house has a few rooms with wood walls like this. I am getting inspired to add little touches of greenery around my home this year. I bet it smells fantastic! It must be something in the air around here. My husband's family is from Norway, and now I am hitting him up for a trip to visit. I want to live their life for just a couple weeks. 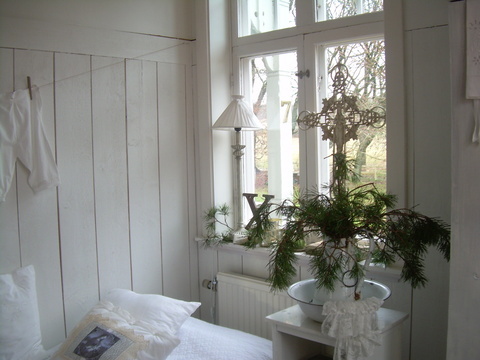 I have really fallen in love with the relaxed and casual decor in Scandinavia. But I have a feeling I am going to have to bring a few extra suitcases to bring all my buys home! Wish me luck...maybe I will find a couple of plane tickets in my stocking. I have been a good girl all most of the year! some people just do it right! don't they?! thanks for sharing those.....I love the little tree with the candles............and that looks like a REAL gingerbread mansion! amazing!! This house is absolutely gorgeous! I am loving all the white - the more I see - the more I love! I so hope you get tickets in your stocking! It would make for an amazing trip!! I also - love hate Ikea! I definitely agree with the quality. However, it's so far from us, I only get to go every few years, so I usually am loving it when I'm there! Gorgeous! 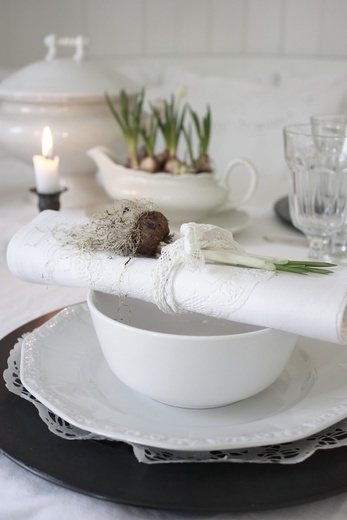 I have to be honest here, I have a love hate with IKEA, ekkk...i don't really understand the hoopla over it, maybe I am totally missing the boat here....but these photos are AMAZIG!! Thanks for sharing and I really really hope you get those tickets in your stocking..that would be so much fun! I've never been in an Ikea store and am a total junk store gypsy that hates chains/malls but these photographs are marvelous! I've perused your blog several times and you have mad skills for furniture refinishing in regards to the shabby chic style. So many pretty white painted pieces! What a timely post, I'm heading to Ikea tomorrow to pick up dining chairs..and a few other things that fall into my cart. Wonderful pictures and yes that piece does look like Holly's (I'm a stalker too)..........thanks so much for "following" my blog.......I'm definitely adding yours to my list.